I wanted to get the glimpse of Swedish life, while I was staying in Copenhagen. The best option was to go Malmö and Lund in morning and comeback in late night. I took morning train to Lund from copenhagen central station. Sweden is not far from Copenhagen, you just need to cross famous Øresund Bridge. This bridged is one of engineering marvel and I could see one of worlds biggest wind farm while crossing it. Lund was less crowded than Copenhagen. I was able to find the tourist office after asking few Swedish. Tourist office was in Stortorget square, very near to railway station.Lady on the reception gave me free map suggest me to walk around and see cathedral, university and botanical garden. It was sunny day and seems everyone was in holiday mood. Lund cathedral is more than 1000 year old and it can be called as major attraction in the city. Long history is associated with this spectacular cathedral. This city is also known as university city. Lund university is one other oldest and biggest in Europe. 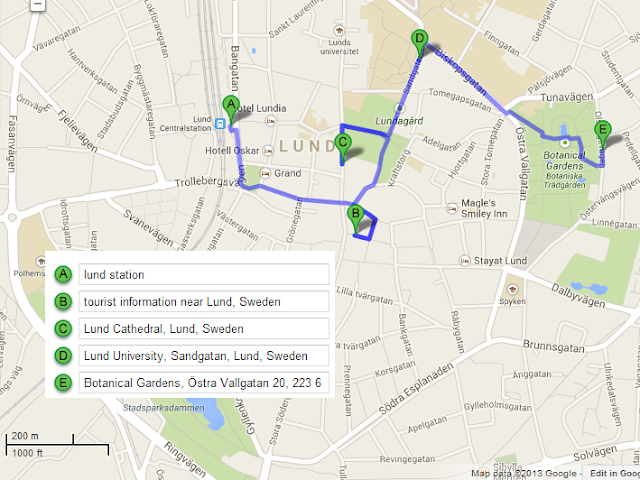 There is a Botanical garden under lund university It was nice walk inside the beautiful garden. After spending beautiful afternoon in lund i decide to go to Malmo.